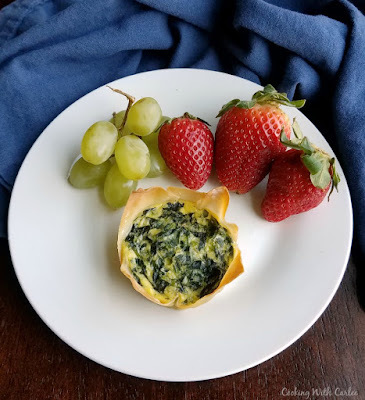 Tiny little quiche are filled with spinach and cheese for a couple bite of brunch goodness. They are perfect for making ahead and heating and eating later! Making mini quiche are perfect on so many fronts. First of all, it is built in portion control. Each one comes in at about 100 calories depending on the exact ingredients you use. They are full of flavor. The eggs and cheese are great sources of protein and minerals, spinach brings the fiber and vitamins. Plus they are in a easy grab and go crust. What's not to love? These mini quiche are a great make ahead meal. The recipe makes a bunch so they are great to make ahead and heat a couple at a time for breakfast. They are also great for parties! I made a batch they day before our Easter party. The day of I just placed them on a cooling rack over a baking sheet and popped them in the oven. A few minutes later they were ready to go. This was a perfect way to reheat them without the bottoms getting soggy. You can also pop them in the microwave for 30 seconds to a minute and you are ready to go! With a batch of these and 36 mini ham and cheese quiche I was able to serve brunch to a crowd without breaking a sweat! Grease muffin tins and place a wonton wrapper in each well. Make sure wrappers are flat on the bottom of the tin and the sides are all the way out against the edges of each well. With a whisk, stir cream cheese until smooth and easy to work with. Add eggs, a few at a time, stirring until completely incorporated and smooth. Stir in milk. Then add spinach, cheese, green onion, salt and pepper. Spoon egg mixture into each wrapper. Bake for about 20 minutes or until set. Remove from muffin tins and serve immediately or cool on wire racks. These look great (and healthy because of the spinach, right?)! Thanks for partying with us at You Link It, We Make It! I'm pinning! Definitely healthy (or at least could be much worse!) Thank you! These look lovely - over from you link it we make it! These looks tasty and easy to make. Pinning and Stumbling. These look delicious and so simple to make. Thanks for linking up with us at Funtastic Friday. Hope to see you back next week! They really are both! Thanks! I love these Mini Quiche, great for a crowd, thanks so much for sharing with us at Full Plate Thursday! They were perfect for a crowd! I made 72 mini quiche and most of them were gone by the end! These look great Carlee! I made something similar last week, but these look much healthier! Thanks for linking up at You Link It, We Make It :). Pinning! Thank you, they were delicious! Thanks for hosting! Love the look of these Carlee! I love using wonton wrappers.. so versatile! Thanks for linking up at You Link It, We Make it! I just love all of the fun things you can do with the wonton wrappers! Thank you for hosting! I've never cooked with the wonton wrappers but I'm going to have to try this recipe. We enjoy a good quiche especially with spinach. Pinned it! So glad you party with us at Merry Monday. 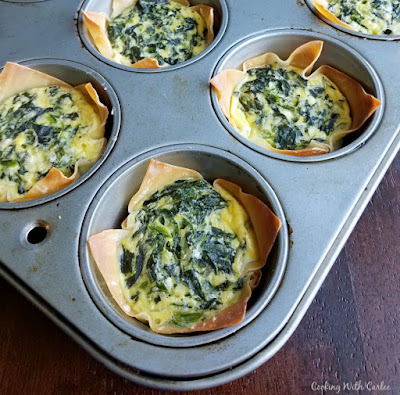 I love mini quiches, but had never thought of using wanton wrappers, what a great idea! Thanks for sharing with the Blog Fair. Thank you! It is a great way to make a lot of them quickly! Thanks for hosting! The wonton wrappers are such a great idea, and I love that they are only 100 calories and portable! It makes them so fast and easy! Build in portion control.... until I eat four in one sitting ha ha! These looks delicious!! It's tempting to eat 4, that is for sure! Thank you! I love the make ahead aspect of these little bites of goodness. It makes entertaining a breeze! Love these little guys. I'd totally make a batch on a weekend and bring them to work all week, topped with salsa (because I top all eggs with salsa). I love salsa on eggs as well! Yum! I love using Won Ton wrappers for appetizers and this will be my next one to try! Perfect for brunch! So glad you shared this at our celebrate 365 Blog Party Brunch Week link up! The won ton wrappers make them so quick and easy. I hope you love them! Quiche is one of my favorites! I love this is portable too. I could eat it for every meal, Spinach is my first choice, broccoli is 2nd! Oooh, now I want to do a broccoli version too! Thanks, Shelby! I love these in wonton cups. Anything that strips out half the prep work before a party or brunch is fine with me. And I think everyone loves quiche. Remember the old "real men don't eat quiche"? Funny, I have seen plenty of quiche put away in short order by that demographic. Always a winner. Every little short cut is definitely welcomed when you have a whole spread to put together. But heck, I'm grateful for a little shortcut here and there any time! And I've seen plenty of men put a hurting on a quiche too! Thank you! I can't wait to try these for breakfast. This looks delicious! They are so easy to put together too! Thanks! 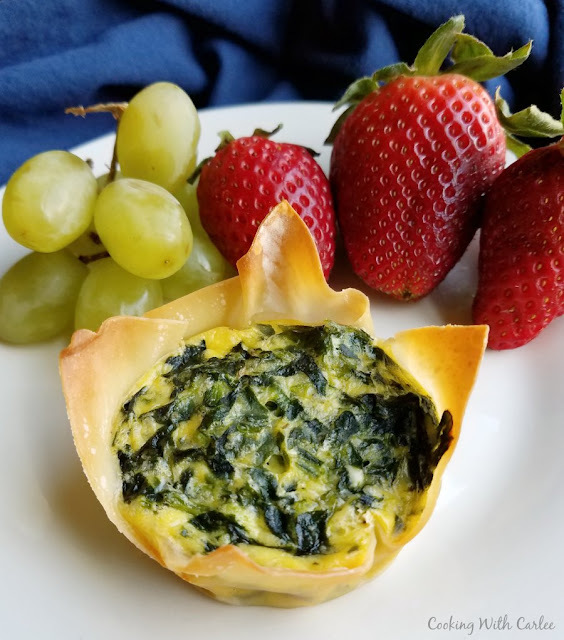 The mini spinach and cheese quiche is such a great idea. I do like the idea that they have built in portion control. We all need that sometimes. These sound very healthy and we are trying to eat more healthy right now, so I will have to try them. Thank you for sharing. They feel a little indulgent too, which make them extra fun!